The AirOne personal air sampling pump is designed for OSHA compliance monitoring in the asbestos and lead abatement environment where it might be subjected to rough handling and exposure to water and humidity. It is watertight. The thick Lexan polycarbonate case resists cracking, and the internal components are designed for reliability and long service life. 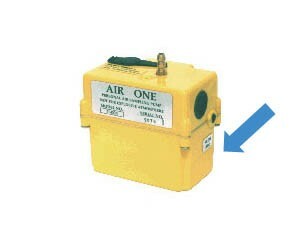 The AirOne is manufactured in the USA by Trigon Industries, Inc. This is for the Yellow pumps. Red Batteries are no longer available.